Fourth Row Center: Film Writings by Jason Bailey: On DVD: "Treme: The Complete First Season"
Following up the most critically acclaimed television series in recent history can’t be an easy task, so the viewer (and the writer) approaches Treme, David Simon’s first television series since The Wire (not counting the mini-series Generation Kill) with a mix of hope, fear, and patience. As countless writers have said before (and at far greater length), The Wire was a singularly unique television experience, a dense and complex ground-level look at street crime from every possible perspective. Simon’s wisest move in assembling his next series was to pursue both a different genre and a different style; any attempt at a multi-layered crime drama would certainly provoke comparisons to The Wire, and at this point in that show’s vaunted trajectory, that’s just asking for trouble. Instead, with Treme, we have a series that takes its predecessor’s strengths—strong writing, brilliant ensemble cast work, and a sure sense of time and place—and meshes them with a more relaxed sense of storytelling and an Altmanesque approach to characterization and connectivity. The results are breathtaking. Lightning has struck twice. The series is set in New Orleans, according to the opening titles, “three months after.” We do not have to be told after what. The first season is focused on the aftermath of Katrina, as seen through an interlocking group of residents: jazz musician Antoine Batiste (Wendell Pierce), struggling to make ends meet; his ex-wife Ladonna (Khandi Alexander), trying to locate her brother, who disappeared in the flood; Toni Bernette (Melissa Leo), the lawyer who is helping her; Toni’s husband Creighton (John Goodman), a writer and English professor at Tulane; Davis (Steve Zahn), an easygoing musician and DJ; his sometimes-lover Janette (Kim Dickens), a chef trying to get her restaurant back up to speed; Mardi Gras Indian chief Albert Lambreaux (Clarke Peters); his son Delmond (Rob Brown), a successful jazz musician; and Sonny (Michael Huisman) and Annie (Lucia Micarelli), street musicians with a complicated personal history. The show has The Wire’s sense of dialogue written from the inside-out; as with that series, it is filled (particularly early on) with jargon and shorthand, this time between musicians rather than cops and dealers. But in contrast to the tight, compacted storytelling of that series, Treme is loose and mellow; the show is never in a rush, frequently pausing to hang out, relax, and listen to the music. It’s a richly atmospheric series, borderline anthropological at times, full of deeply-felt details and earthy humor. This is not to imply that there is no tension (in episode five, the intercutting of Janette’s cooking for a table of New York chefs and Batiste’s interactions with a Japanese jazz fan puts your heart into your throat); merely that the writers and directors (including such recognizable names as Ernest Dickerson and Brad Anderson) soak up the vibe of the locations, and play their scenes accordingly. They’re also doing some unexpected things with our expectations of the characters. In the early episodes, both Antoine Batiste and Creighton Bernette are framed as protagonists; Batiste arrives for a funeral parade a little late, hustling his way up to the front while blasting spiritedly on his trombone in what could only be described as a hero shot, while Creighton gets a crowd-pleasing, rabble-rousing scene with a smug British television reporter. Both are placed at the center of events, and both actors have the charisma of sympathetic leads, but as the season moves forward, layers are peeled away—come to find out, Batiste isn’t the most honorable guy, and while Creighton is bright and funny, a darkness and sadness is slowly, masterfully revealed. Neither role is easy; both are done beautifully. Most of the characters are equally intriguing, though it must be noted that there are a couple of duds—with the exception of their prickly first scene, I’ve not much use for the busking couple, whose story arc has a predictability elsewhere absent from the series. But the actors filling the roles are good nonetheless (and special praise is due to Micarelli, a musician making her acting debut). Every performance in Treme, in fact, is as good as the next. Peters, an actor seemingly incapable of an inauthentic moment—he was Lester Freamon on The Wire—disappears completely into this very different role; from his first scene, which captures effortlessly the sheer emotion of walking through one’s broken home for the first time, we’re with him. Brown, the fine young actor from Finding Forrester, finds just the right note for his slightly impatient son, while Zahn is perfectly cast in a role that seems a natural evolution from the dart-eyed schemers he’s played on film. Alexander (from Simon’s first HBO mini-series, The Corner) handles several difficult moments well, and in her final scene—walking the “second line” of a funeral—she’s doing things as an actor that I can’t even begin to describe. Leo has had a tendency to push a little too hard as an actor lately (particularly in her Oscar-winning turn in The Fighter), but she’s just right here. Everyone, down to the minor characters—Jacquez, LaDonna’s mother, the Japanese jazz fan, even the “I’m home for Mardi Gras” day player—is given depth and dimension. Several actors from The Wire turn up in small roles—Jim True and Steve Earle among them—as does Tim Reid, star of the last great New Orleans series, Frank’s Place. And most intriguingly, multiple figures from the Bayou music scene (including Allen Toussiant, Kermit Ruffins, Dr. John, Terrence Blanchard, and Troy Andrews) pop up as themselves. Their presence gives the show’s considerable musicality an even greater sense of authenticity. From the pilot episode, New Orleans jazz provides the series’ heartbeat; it is a constant. When Janette walks into her kitchen, she moves immediately towards the radio, asking her sous chef, “It’s so quiet, how can you work?” Later, Batiste visits his friend and trombone teacher in the hospital, putting an earbud into each of their ears and sharing a song from his iPod; the music is a life force. The show goes to great pains the capture the nuances of the modern jazz scene—the different subgenres of the music, the different gigs, the different players, the rivalries and jealousies. But, more than anything, Treme mirrors the mood of the music. There is joy, and there is vibrancy, and there is pain. So, so much pain. Much of Treme’s debut season is focused on the first Mardi Gras after Katrina, and as the show lovingly intercuts its deep bench of characters brought together, often bittersweetly, on Fat Tuesday, the show’s debt to the work of Robert Altman becomes clear—particularly to Nashville, another story of a city in which the music acts as commentary and counterpoint, as the Greek chorus of a community as rich and vibrant as the sound it makes. That the series not only invites that comparison but earns it is about the highest praise I can imagine. 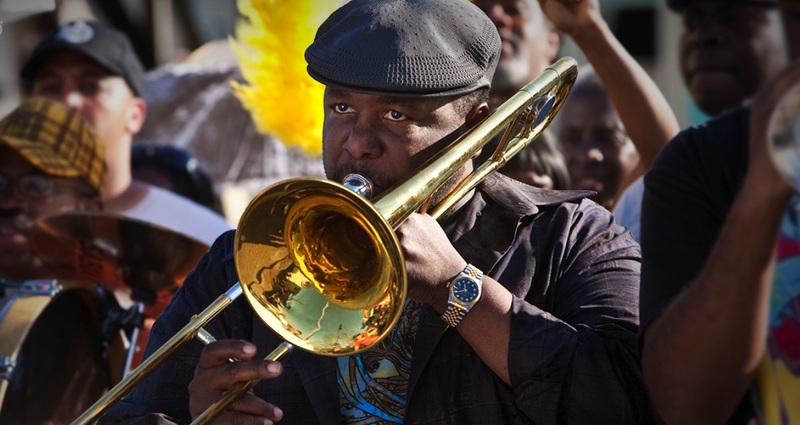 "Treme: The Complete First Season" debuts today on DVD and Blu-ray. For complete A/V and bonus feature details, read this review on DVD Talk.